Yokogawa’s DTSX product family is engineered with a variety of fiber optic sensing cables that provide continuous temperature sensing for long distances. Our solutions provide enhanced visibility into your process, allowing you to detect problems before major catastrophic events occur. Traditional temperature measurement such as point measurements or IR cameras may not provide the same level of coverage as that of a continuous optical fiber solution. Operators need to efficiently and effectively measure and alarm process leaks, hot spots, cold spots, and fire detection in real time over various lengths. Being able to identify these events within a timely fashion, indicate their specific location, and then be able to resolve these events immediately is paramount to smooth plant operation. DTSX gives you the insight needed to proactively prevent abnormal situations, reduce safety and fire risks, and identify irregular conditions and shifts in process applications. Our fiber optic temperature sensing products offer high reliability, accuracy, and quick update times to ensure 24/7 monitoring of the application with no downtime for maintenance. What is Distributed Temperature Sensing? What is the Raman Scatter Principle? DTSX1 is an all-in-one heat detection solution. It is a self-contained, ready-to-install solution. Distributed temperature sensing (DTS) measures temperature distribution over the length of an optical fiber cable using the fiber itself as the sensing element. Unlike traditional electrical temperature measurement (thermocouples & RTD), the length of the fiber optic cable is the temperature sensor. Distributed temperature sensing can provide thousands of accurate and precise temperature measurements over a long distance. Compared to traditional electrical temperature measurements, distributed temperature sensing represent a cost-effective method for obtaining accurate and high resolution temperature measurement. Yokogawa DTSX3000 measures temperature and distance over the length of an optical fiber using the Raman scatter principle. A pulse of light (laser pulse) launched into an optical fiber is scattered by fiberglass molecules as it propagates down the fiber and exchanges energy with lattice vibrations. As the light pulse scatters down the fiber optic cable, it produces stokes signal (longer wavelength) and anti-stokes (shorter wavelength) signal, of which both signals shifted from the launch of the light source. The intensity ratio of the two signals components depends on the temperature at the position where the Raman scatter is produced. This temperature can thus be determined by measuring the respective intensities of the stokes and anti-stokes signals. Furthermore, part of the scattered light, known as the backscatter, is guided back towards the light source. The position of the temperature reading can thus be determined by measuring the time taken for the backscatter to return to the source. All light interacts with matter! For example, imagine standing in a pitch black garage with no external light source. Inside this garage is a bright red sports car. Needless to say, you cannot see the sports car or the color of the sports car itself. However, when you turn on the lights to the garage, you can immediately see the light source reflecting the bright red color off the car. The light that is bouncing off the red sports car is only bouncing off the "red" spectrum, therefore, your eyes see the sports car as, well, red. This phenomenon is also true when you shoot a pulse of light (laser pulse) off of a molecule, in this case, the fiberglass molecule in the optical fiber cable. When the light source enters the optical fiber cable, most of the light bounces (backscatter) back unchanged (no change in wavelength). However, a small amount of that light shifted/changed. That shift/change from the light source is called Raman Scatter. Since Raman Scatter is thermally influenced by temperature, the intensity depends on temperature. Distributed temperature sensing is capturing the shift/change from the propagating light pulse and measuring the intensities between the two signal components (stokes and anti-stokes). 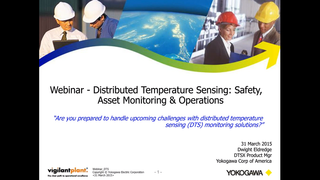 In this webinar you will learn how temperature detection with DTS avoids loss of revenue. Leakage, accidents or malfunction means loss in production and thus loss of revenue. By detecting a fire or a system malfunction before major environmental damage occurs, the operator can significantly lower the risk profile to major environmental incidents. With DTS you can reduce risks and increase safety. After the webinar, attendees will leave with a basic understanding of DTS technology and where and how they can use DTS for their temperature solutions in different applications.